Happy Friday! Today I have an FO to share. 😀 I was able to finish up my Stripey Socks yesterday! These will be fun and bright to wear once it gets cooler again. Notes: Generic toe-up sock using Wendy D. Johnson’s slip stitch heel and my rounded toe. I love the fabric I get on US 0’s with this yarn. I may try to knit my next pair of Vesper self-striping socks with the same gauge. Just a bit tighter then what I’ve been getting on my stripey socks. Last week, Sheri of The Loopy Ewe blogged about Camp Loopy. Just a few days before I read her post, I had been wishing I could go to summer camp this year, and this kind of camp is right up my alley! The first challenge project to go along with the theme “Campfire Nights” is to knit a two color cape, shawl, or scarf. I decided to knit a pattern that has been in my queue for a while now: Clockwork. After some thought on what colors and yarn to use, I decided on MadelineTosh Pashmina in Dahlia and Oak. This weekend I’ll wind up the yarn, print out the pattern, and find the right needles so I’ll be ready to cast-on on June 15th! 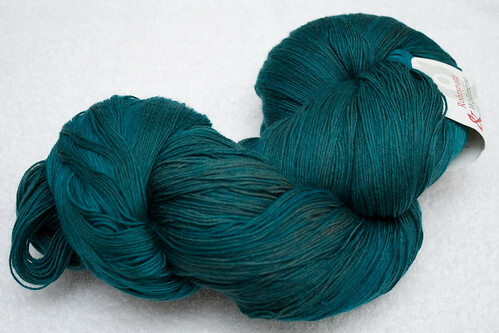 Since I decided on no more sweaters for a while, I’ve been searching around for a shawl pattern to knit, preferably one that would look good out of one of the Wollmeise Lace colors I have. I haven’t seen anything that just called to me to knit it, so I just kept looking. Then, this past week, Kris mentioned to me on Twitter that we should do another knit-a-long (we knit Camber together via Twitter last year). After some discussion, we decided to knit High Seas. I thought this would be perfect for the Wollmeise Lace I have in Flaschenpost, which is a lovely blue-green color that reminds me of the ocean. The fact that the shawl looks like waves, doesn’t hurt either! I love the ocean and frequently find myself missing it. We’ll be casting-on on Monday. I’ve already got the pattern printed, just need to wind that GIANT skein of yarn this weekend. Previous Post I’ve Been Crocheting, Spinning, and Knitting! 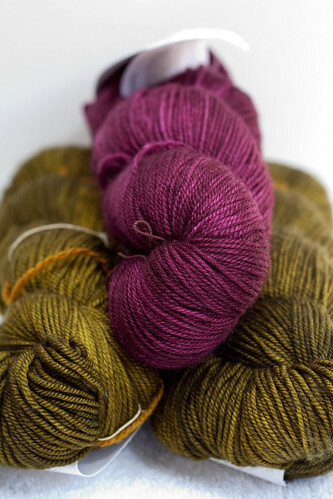 With that Wollmeise and that pattern, you are going to end up with a stunning shawl! Ooh, that High Seas looks wonderful!!! I may have to add that to my “to do” list! !